Chris Stock, owner of Philadelphia Salvage, rescued the kitten after discovering the cat in a building scheduled to be demolished. For the last couple of weeks, I’ve been obsessed with a kitten — which doesn’t make a lot of sense, given how allergic I am to cats. Abraham the Salvage Cat was introduced to the world on Facebook Live on March 4 when Philadelphia Salvage owner Chris Stock and his crew were digging through a decrepit house looking for treasures — yes to the antique sink, yes to the cast iron hinges, no to the Captain America Frisbee even if he did do a double-take when he saw it light up. Stock was live-streaming his finds for his followers when suddenly in the background, there was the faint sound of a meow, which grew louder as he dug deeper into the home around Fifth and Girard. “Wait, what is that? Cats?” he asked as he stood over a cardboard box. Inside was the little fighter, meowing up a storm. His litter mates were dead. His momma nowhere to be found. Temperatures were dropping. The house was scheduled to be demolished. He scooped the kitten up and abruptly ended his video. Back at his Westmoreland Street shop, Stock and his employees rushed to warm up the little guy and get some food into him until they connected with Project MEOW (Make Every One Wanted), a local nonprofit that stepped in to help. (You can help, too, by reaching out to them on their Facebook page or website.) Stock named him Abraham, after the man who owned the home. Naturally, he was given a hashtag: #salvagecat. Between assignments, I’d check in to see how the kitten was doing, trying to stifle my gushing “awwws” so as not to ruin my surly reputation. 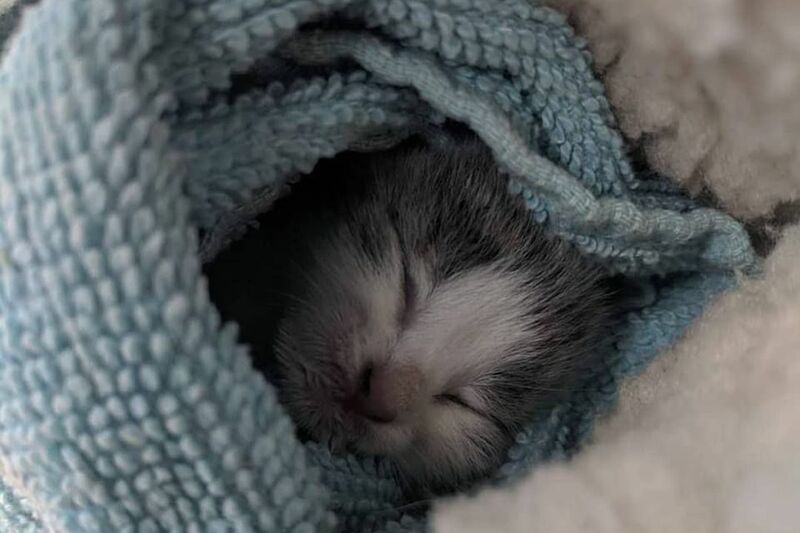 And I was hardly alone — thousands of people viewed the #salvagecat updates: Abraham asleep in the palm of someone’s hand; Abraham being bottle fed; Abraham swaddled in a wool hat. That photo was tagged #purrito. When I called Project MEOW’s executive director, Tracylea Byford, she was not surprised by the outpouring of interest. Who could resist such a cutie? It’s what happens to the other Abrahams, the ones who don’t get rescued in the nick of time, that keeps her and other cat lovers up at night. Thing is, there are lots of Abrahams out there, especially during kitten season. By some estimates, there are as many as 400,000 stray cats in Philadelphia. It takes a village of committed volunteers to try to help them. At Project MEOW, Byford told me, the mission is rescue, outreach, and TNR, “trap-neuter-return,” where cats are humanely caught, neutered, vaccinated, and then returned to where they were collected and allowed to roam free. When I admitted I didn’t know much about that approach, no one I spoke with was surprised. It’s labor intensive and somewhat controversial. Not everyone wants to see the cats back in the community. And it’s not always as hopeful or uplifting a narrative as Abraham’s. “The reality is, most of the Abrahams out there are just going to die," said Aine Doley, founder of Catadelphia. “That’s very lucky what happened with him." For three years, Doley managed Philly’s Community Cats Project. She recently founded her own nonprofit, with a focus on outreach and education that goes both ways — meaning they empower communities to care for cats with TNR workshops and provide information on free services, including spaying and neutering, but also advise outsiders not to make assumptions about animals in neighborhoods that they might not be from. Not everyone is on board with TNR, but before I make any judgment call, I’ll tag along on one of their missions. In the meantime, I went back to stalking Abraham on social media and called Byford for an update. Plot twist: Turns out, Abraham is actually a girl, and is now known as Abbie. Things are looking good, Byford said, with one final push to put all the cuteness in perspective. Those older cats in need of a home? They used to be Abrahams and Abbies, too.